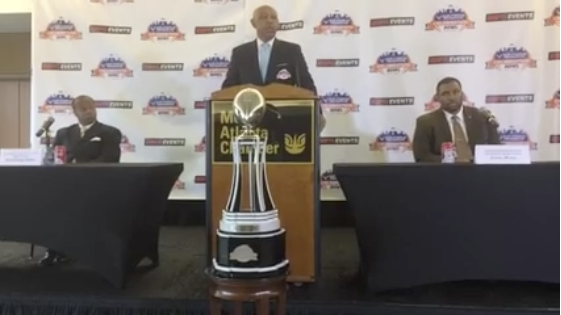 The countdown to the Celebration Bowl between Grambling State and North Carolina Central officially kicked off Thursday in Atlanta with a press conference introducing the head coaches of both programs. Grambling head coach Broderick Fobbs and NCCU head coach Jerry Mack were joined by Celebration Bowl executive director John Grant, Col. Tim Marks of the Air Force Reserve (the Bowl’s title sponsor) and MEAC commissioner Dennis Thomas. Peach State College Sports founder Sam Crenshaw, who will be calling the game for the Celebration Bowl radio network, moderated the question and answer session for both coaches. SWAC commissioner Duer Sharp, nor any other representative of the conference office, was present for the press conference.